When he sees his cabin at Camp Half-Blood, filled with power tools and machine parts, he feels right at home. But there’s weird stuff, too—like the curse everyone keeps talking about, and some camper who;s gone missing. Weirdest of all, his bunk mates insist that each of them—including Leo—is related to a god. Does this have anything to do with Jason's amnesia, or the fact that Leo keeps seeing ghosts. Finally, after a rather long hiatus, I came across the above title in the local library and just have the urge to pick it up, bring it home and curl up with some juice for some Greek adventure. However, Heroes of Olympus Series not just features Greek gods but their Roman alter ego as well. Zeus is Jupiter, Hera is Juno, etc. Jason is a new hero from the Roman camp. Revealing this would not really affect your enjoyment of the story but this fact was not revealed in the book until three quarter into the story. But Jason has lost his memory and he wasn't aware of his Roman side and was assimilate into Camp Half-Blood. He went on a quest with Piper and Leo and the book focus on their relationship as well as the quest. Percy wasn't really featured in this book other than the fact that he's lost too and no one from Camp Half-Blood especially Annabeth is able to locate him. We will get to know what happen to Percy in the second book of Heroes of Olympus Series, Son of Neptune. 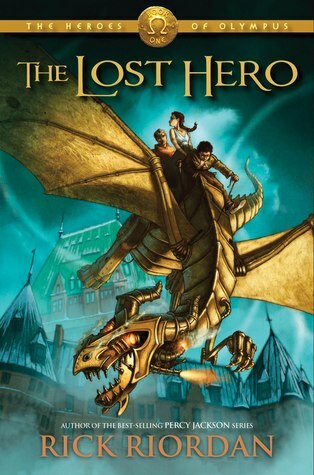 I quite enjoy the Lost Hero. Much better than the other series by Rick Riordan which features the Egyptian Gods which I read just the first book and did not continue thereafter. Watch out for the review of the second book Son of Nepture which is coming right up.